Thanks to “JC” for a recent comment on this blog expressing his frustration that his staged home didn’t sell. It’s awful to be in that situation when you feel like you’ve done everything “right”. I don’t know JC or even what city he lives in, but he said he spent a lot of money on staging, used the stager’s “hand-picked Realtor”, and even moved out of his house while it was on the market. Home staging is but one (important) piece in the puzzle of how to get your real estate sold fast. It’s possible that the stager’s “hand-picked Realtor” was not the right agent to hire for his particular neighborhood or price range. For example, it’s generally best to list with a real estate agent who specializes in your neighborhood and price range. After all, if they usually sell million dollar homes and you have a $350,000 listing, it won’t get the same attention. Why? Because their commission on your home is way smaller AND they know more potential buyers in the higher price range. Plus if they don’t normally work your neighborhood, they’re not as knowledgeable about it. So they don’t have buyers there, don’t know the area agents as well to talk up your property, and may recommend the wrong listing price. Worse, in some areas like the one I live in, if you hire an out-of-area agent the other agents in the neighborhood won’t show your home! There are good agents and bad ones. I have certainly fired a few real estate agents over the years of buying and selling my own homes. Were there strong photos on MLS? Unfortunately, many home sellers have found that even after staging, the listing agent will keep the old photos on MLS. Or they don’t take good interior shots at all! With 90% of potential buyers in Canada (and 70% in the US) searching MLS online themselves before calling an agent to book a showing, the listing photos are critical in attracting potential buyers who want to see the property in person. If your home is on the market, make sure you see what it looks like on MLS. If the photos don’t show your property in its best light, demand that they be changed! Naturally, it’s up to you as the home seller to make sure your home is “photo ready” when those shots are taken, either because you’ve hired a professional home stager or you’ve done the work yourself. Don’t expect your agent to tidy the place for you! How well did the agent market your property? This is another benefit to hiring a real estate agent that specializes in your neighborhood. They know the other agents who have buyers looking there and it’s easier for them to talk up your listing in office meetings, get attendance at a broker’s open house or caravan, etc. Marketing also includes feature sheets, MLS photos, advertising, open houses, virtual tours, special websites, etc. When hiring a listing agent, make sure you discuss what marketing they are going to do ahead of time! Choosing the right listing price is critical because even if your home shows well, it needs to be priced realistically for what it is. Get out there and physically walk through homes that are listed in your area and price range to see first-hand how yours stacks up. Listen to what listing price your agent recommends (it’s best to get at least 3 points of view on this, there can be a significant range) and then compare this with what other agents have recommended and what you see for yourself by going into other listings. Beware that some agents will suggest way too high an asking price to “buy” your listing, figuring they’ll talk you into a bunch of price reductions later. The time of year and how many competitive listings are on the market at the exact same time as you will effect how long it takes you to sell. For example, if you put it on the market at the slowest time of the summer or over the Christmas holidays, it will take longer to sell because there are fewer buyers. Is it the “right” house for the neighborhood? If you are trying to sell a 2-bedroom in a neighborhood of 3 and 4-bedroom homes, it will still sell, but it will take longer because your pool of buyers is smaller. Is the staging any good? Like any profession, there is good staging and bad staging. Some err on the side of decluttering so much a place practically looks vandalized. Others, add so many cutesy touches and use so many silly staging tricks, they are totally distracting to potential buyers. In his comment, JS assumed staging was a waste of money, but if it didn’t sell with staging, it’s unlikely that his home would have sold without it. I don’t know how long his house was on the market, or any of the other factors mentioned here. I wanted to share these so that everyone will take into account the full picture of what sells a house when it’s time to list theirs. Please share your comments or experiences here. They will help others and also suggest new topics that you want me to write about further! Learn more about how Six Elements can help you with home staging advice. 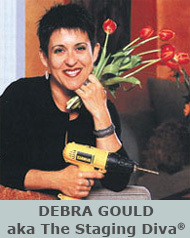 Internationally recognized home staging expert Debra Gould is President of Six Elements Inc. and creator of the Staging Diva Home Staging Business Training Program with over 4,000 students in more than 20 countries. 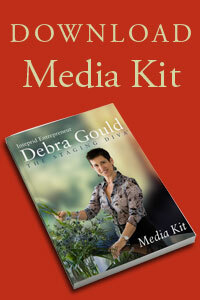 An entrepreneur since 1989 and author of several staging guides Debra has staged millions of dollars worth of real estate and uses her expertise to train others worldwide. Thank you for your response. I would be happy to share the details of my experience with you by email if you are interested. 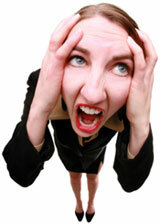 I just want to warn people that staging is NOT the panacea that Realtors and designers these days make it out to be! All that is promoted is the success, and that does not give sellers an accurate picture of what they can expect. In my experience, many homeowners want to do a minimum amount of work before putting their home on the market. We have advised wallpaper removal and neutral paint, we have advised gym equipment be removed to feature a room as a bedroom, we have suggested yard clean-up and many more basic fixes which homeowners decline. As our specialty is owner occupied homes; we can only do so much with the property to make it look its best within the restrictions by the homeowner. Susan, we are always limited by what the homeowner is willing to do, I’ve experienced that too. After all, it’s the client’s home, it’s their money and bottom line, they’ll also live with the consequences of their decisions. All we can do is offer our best advice and explain why our suggestions are important. I always rank my recommendations in order of importance, from “must do” down to “nice to do if you still have time/buget”. But I can tell you that as I raised my rates for the initial consultation it made a big difference in how much of my advice my clients were willing to act on. If you offer top notch advice and charge a premium for it, by and large you’ll have clients who come to you when they want the best and value the advice you give them. When they really value your expertise, they are less likely to ignore it. Totally a believer in staging. I am personally not good at it but know people who have the “gift.” I have a neighbor who refused to get rid of stone cupid heads in her front lawn even though she is trying to sell her house. She won’t listen to the Realtor or anyone else. Self-sabotage. 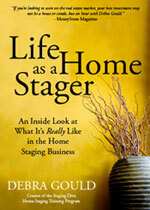 I’m a stager and I just finished staging and selling my own home. We had a great realtor, the house looked great (very positive feedback from buyers), we did our research, thoroughly, but we didn’t expect that the school behind us was going to be such a deterent… we dropped the price $15,000 and sold a few days later, but got 99% of asking. I have to admit that I took it as a hit on my talents, but I know now, when the half dozen comporable homes that were listed before and after ours, have still not sold, that staging does work! If our home wasn’t staged, I think we would have likely had $15,000 more chipped away – staging costs were about $2000. I’d say a pretty decent ROI! Catherine, Thanks so much for sharing your experience with staging and selling. I know it will be inspiring to others. Investing $2,000 in staging to sell for $15,000 is a GREAT return on investment. I definitely ran into this when selling my own home. I staged it and got wonderful feedback but the fact that there were power lines directly in the back yard was a definite concern for buyers. Consequently we had to drop the price a few times! I think otherwise it would have sold within one the first few showings because those buyers loved the house but just couldn’t deal with the power lines. Just another reason some homes don’t sell right away. Thanks for sharing your experience Cari! When there are problems like power lines in the back yard, setting the right price, and making the home as appealing as possible are both key. We are having our home staged as I speak. More needs to be said about bad- and over- designing and decorating done by stagers (thanks for your touching on the subject here). We decluttered only to have it recluttered, with decor that to me has lessened the percieved value of my high-end home. What a joke! Thanks for commenting Thomas. Sadly, there is a lot of bad home staging out there. That’s why it’s important to review a home stager’s portfolio before hiring them. Also, ask them about those projects to make sure it’s really their own work. Unfortunately, there are some “home staging training” that provide fake portfolios. That said, it’s possible that your home was too de-cluttered and the home stager added items to make the environment more welcoming. While they might not be as “high end” as your home, remember you are selling the house not the contents. So unless they were egregiously out of keeping with the price point of the house, you should be fine. By the way, this is one of the pitfalls of hiring a home stager with their own home staging inventory. What they have in their own storage facility might not be appropriate to your home but they’ll use it anyway because that’s what they have on hand. I prefer to work without my own inventory which enables me to custom select the right pieces for each client’s home. I use third party suppliers who have tens of thousands of square feet of items for me to choose from. I’m amazed, I have to admit. Seldom do I come across a blog that’s equally educative and engaging, and without a doubt, you have hit the nail on the head. The issue is something that too few folks are speaking intelligently about. I’m very happy that I stumbled across this in my search for something concerning this. There are many reasons why a house might not sell. If the location or the neighborhood has buyers objecting to something, then it has to be reflected in the list price. It doesn’t matter how wonderful the Realtor is when buyers have concerns about certain characteristics of the property. That said, an evaluation has to be made in person inside the house to know what the concerns might be. A seller can not change the location, the neighbors or the demographics, but the condition and the price can be changed. Not all staging is equal. The staging should be customized for the style of home, age of home, the target buyer, the neighborhood and any other unique characteristics of the home. The stager should highlight the architectural features of the home, showcase the space, create a clear purpose for each room, use the design elements of color, balance, and continuity of flow in the home. Staging can vary in quality and appeal. I have gone in to stage rooms and discovered that first I have to sweep and dust and cleaning is not a stager’s job. But what do you do when you were told by the owner of how well they cleaned! I have had clients that even after they move out, decide to have a garage sale and board the dogs there at the vacant house, and of course these activities did not encourage a sale. Before a seller throws the stager overboard, an assessment of buyer concerns needs to be made. Thanks for commenting Beverly and I appreciate all the excellent issues you’ve raised! I think it’s worth noting that sometimes the staging is terrible, and that actually harms the chances for a sale. I have no idea why so many stagers think that giving every bathroom a beach theme is a great idea. I’m looking at listings in a very high price range, and it looks like the staging is done by the same person or the same methodology. If a home is high-end, please don’t put beach signs and sea shells in every bathroom, unless the home is at the beach. Also, it’s so cliche to add some colorful prints from Pier 1, then put matching towels and things tied with raffia around the home. Good staging, like the type you are presenting and teaching, is more than using towels and fake plants and seashells. Honestly, if your stager is using the wrong materials and themes, request that your Realtor hire a different stager. Trixie, you make excellent points. There is a lot of really bad home staging out there. The specific examples you’ve used are all techniques that drive me crazy too. 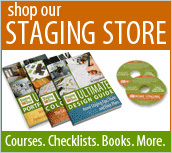 I’ve written multiple articles on what I called stupid staging tricks, over at Home Staging Business Report to educate stagers on avoiding such distracting clichés. Great article! I am amazed that some agents will go the length of staging but never update the photos.